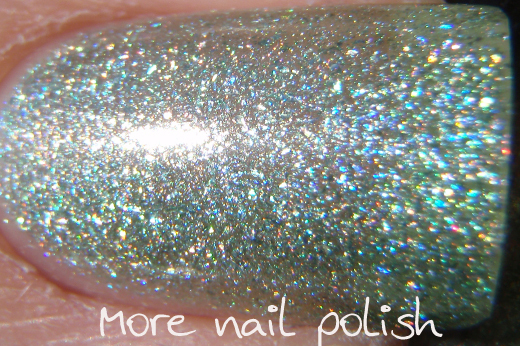 Today I have another Chemistry polish, number 618, which is a light green large particle scattered holo. The absolutely awesome Kristy, who has the most perfect nails on show over at The Polish Haven, recently grabbed this Chemistry polish for me. I wanted to try and fill in any gaps I had in my Ozotic/Chemistry colour guide, and she kindly went searching the Chemistry warehouse and found this. 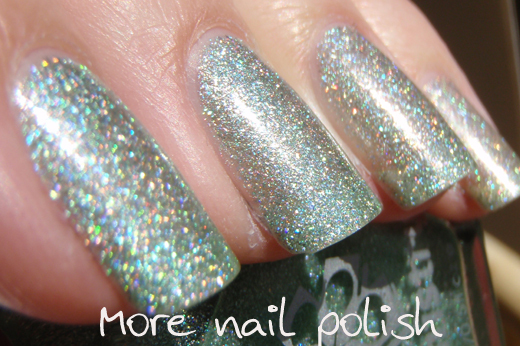 This polish is pretty much the scattered holo version of 517, which is the light green linear holo. A lot of these polishes in the 600 series have matching colour twins in the 500 series, which is pretty nice if you like to mix up the finish on your nails. The holo effect isn't as pronounced on this polish. It really reminds me more of the Milani 3D polishes. In fact I think I should do so comparisons with the Milani 3D polishes against these Ozotic/Chemistry 600 series. 618 Looks great on you, did you end up getting 523? Kristy - Yes thank you, Shatter me Claire hooked me up and I wore it yesterday! So pretty! AM wondering-how do you know when you've added enough spectraflair to top coat? The first batch I had WAY too much and I thinned it out and it looked white/gray, I added more top coat and now there's not enough-it is something you have to do for preference? I just can't get it right! Fingers - to tell you the truth, I haven't actually created just a spectraflair top coat. I have only created full coloured polishes. I thought it would be just a case of adding a tiny bit of spectraflair to clear. You wouldn't want to add very much, otherwise it would become too opaque and you wouldn't see the base colour beneath. I would start with only about two-three grains of rice amount, shake and swatch.